This recipe for homemade Italian nomato sauce is so easy, you’ll never go back to store bought! This sauce has so many uses – my favorite is to make it for lasagna or pasta. The texture and flavor are spot on with that of a traditional tomato sauce or marinara, but without all the inflammatory nightshade vegetables. AIP, Paleo, and Whole30 friendly! 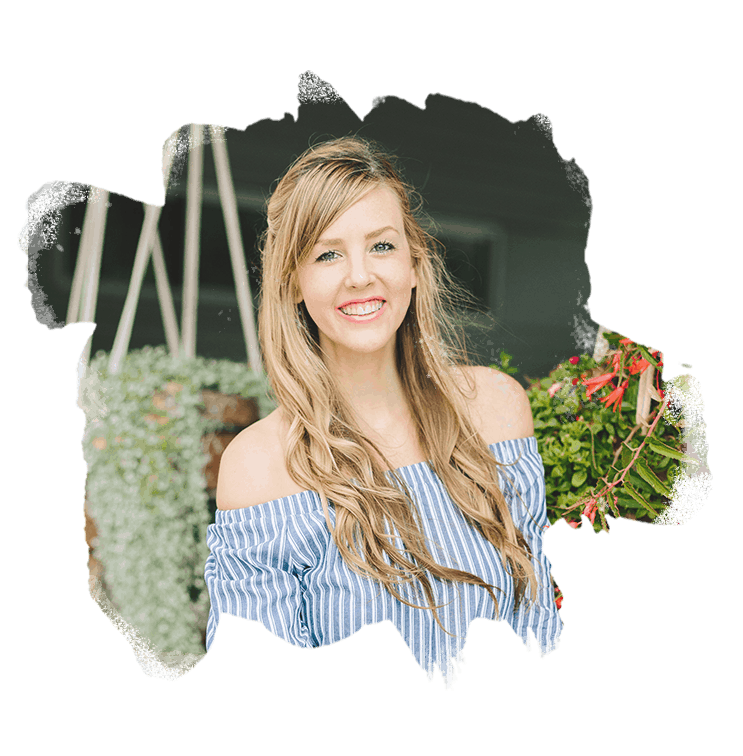 When I first started transitioning to the Autoimmune Protocol (AIP) in 2014, I couldn’t fathom the thought of not partaking in tomato sauce. It’s the perfect combination of salty and sweet, and fills any boring food with flavor. Think about it – how much flavor does traditional pasta actually have on it’s own? I’d stand to bet the majority of the population likes pasta recipes for the sauce, not the actual pasta. At the time of starting AIP, I was a vegetarian who ate tomato sauce on a near daily basis. I’d top everything you can imagine with it: Tempeh, eggs, brown rice, steamed broccoli, even straight from the jar. You name it, I ate it topped with tomato sauce. Fast forward to present day 2017, and I now know (all thanks to the reintroduction phase of AIP) that those daily binges on tomato sauce were causing constant inflammation within my body. If I choose to indulge in tomatoes these days, I’m sure to end up with achy joints in my hands and feet. Which brings me to this AIP Nomato Sauce recipe. Honestly, I can’t believe it’s taken me this long to share this recipe. I’ve been making some variation of it for the past 3 years! Sorry for hoarding it from you for so long ;). I’m here today sharing the recipe with you after finally perfecting the nomato sauce formula. Simply put, nomato sauce is a nightshade free version of marinara sauce. Not sure what nightshades are? Nightshade veggies are a classification of vegetables that have been shown to be a potentially inflammatory food. Nightshade vegetables are to be avoided for a period of time on certain elimination diets like the AIP diet. 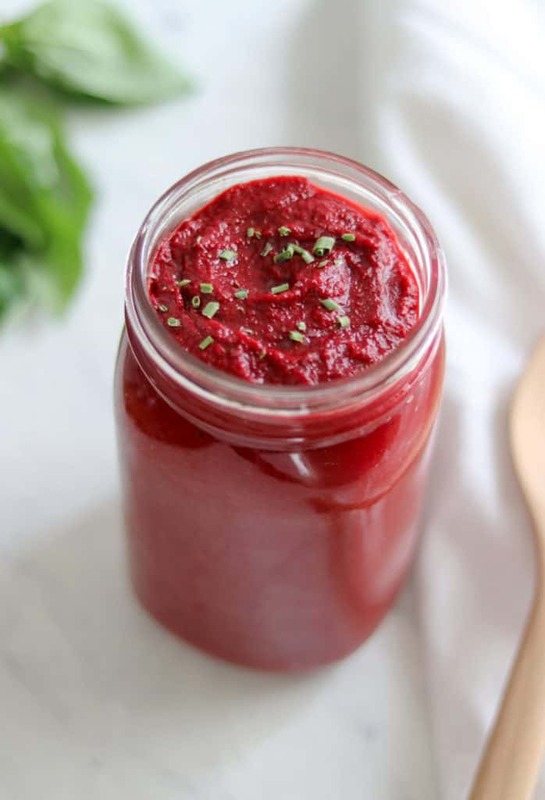 Most nomato sauce recipes call for lots of beets, which is a total faux pas in my opinion. It makes the sauce inauthentically sweet! My recipe calls for just one beet. If you’re concerned about the earthiness of the beet, be sure to scrub it really well, or even peel it before you saute. There are very few ingredients that can change in flavor as much as an onion does when going from raw to sauteed. Don’t skip this step! It makes all the difference. These two ingredients add to the bulk, color, and mild flavor contributions to the sauce. I wouldn’t recommend omitting or reducing the quantities, but in a pinch you could likely substitute in one for the other. Don’t you dare skip this! This is the key to an authentic Italian marinara sauce flavor without the nightshade veggies. It contributes to the color, flavor, and texture of the sauce. I love adding bone broth to up the nutrient density of the sauce and bring an added richness. However, while following a low histamine diet, I used water in place of bone broth and it was still delicious. Sauteed garlic, high quality Himalayan sea salt, and a good spice blend like the one from Primal Palate are totally worth the added upfront expense and time. Don’t skimp out on these! I love to add all of these, but they aren’t necessary! If you have them on hand, I highly recommend including them. If you’re out at the store grabbing the ingredients, my favorite flavor enhancer is the fresh basil. After having been through a low histamine diet, I can truthfully say most food do freeze well. Of course a meal is never the exact same as it was fresh from the oven/instant pot/skillet, but neither are leftovers. This nomato sauce however, is perfect frozen, thawed, frozen and thawed again! It tastes just the same, so much so, that I’ve started creating a triple batch every time I make this and storing the leftovers in wide mouth mason jars in the freezer. So now you know – this nomato sauce freezes well, and makes a wonderful sauce for just about anything you can imagine! What are you waiting for?! Where Can I Buy Nomato Sauce? If you’d rather not make it yourself, there are several online stores and retails stores that sell prepared nomato sauce. There are two brands you can find on Amazon, one brand is called ‘Nomato Sauce‘ and the other is KC Natural. These are great options if you’re short on time, but my recipe is so easy, why would you want to go with store bought when you can have it fresh! Without further ado, here’s the recipe (with secret ingredient!) for my AIP diet Nomato Sauce. Heat coconut oil in a sauce pan over medium low heat. Chop onions and add to coconut oil. Chop remaining veggies while onions saute. When onions are slightly translucent, add chopped celery, carrots, and beets to onions. Once all veggies are soft, add pumpkin puree, diced garlic, bone broth, sea salt, and Primal Palate spice blend. Cook about 10 minutes. Add optional flavor enhancers like lemon juice, basil leaves, olives, and nutritional yeast. Blend with an immersion blender in the sauce pan, or transfer to a blender or food processor. Pulse until you achieve the desired texture. If you prefer your sauce to be a bit thicker, you can reduce the bone broth or water, and if you prefer a thinner sauce, you can add more. I’ve found 2 1/2 cups to be a good middle ground, so I would give or take from there. Enjoy with my AIP Pizza Bite recipe, or add to spiralized zucchini noodles for an AIP take on traditional spaghetti. Click here to Pin this Nomato Sauce recipe! Perfect for those that don’t do tomatoes! I have a nightshade free friend I am going to send this to! It looks so good! Thank you! I’ll have to try this – even though I don’t do AIP anymore I fell in love with no-mato sauces when I did do it. So yours sounds awesome and I hadn’t thought about using it as a dip/condiment on things like veggies, but I’ll have to try that too! I’m such a dipper. 🙂 Hope you like it! I’m so glad! Hope they all love it. 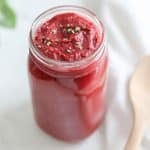 I’m always looking for ways to get more beets into my diet, and this sounds like the perfect way, so savory and comforting! It really is such a comfort! Yep, tomatoes, coffee, and nuts were the hardest for me to give up. Coffee and nuts are consistently hard. Tomatoes have been a lot easier to stay away from, surprisingly. Friggin’ genius, girl. No-mato sauce is a slope I haven’t even tried to conquer and you totally owned it! This sounds great! My body does best without tomato sauce/nightshades, so I really appreciate this recipe. I love that you used kalamata olives in the sauce too. So yummy! This marinara is so gorgeous ! Love that crimson /fuchsia color. Looks so delicious too ! I’ve tried a couple different nomato sauces, but I love the addition of kalamata olives in here! My favorite!! This sauce looks so tasty and vibrant. I love your creativity! Sound great! 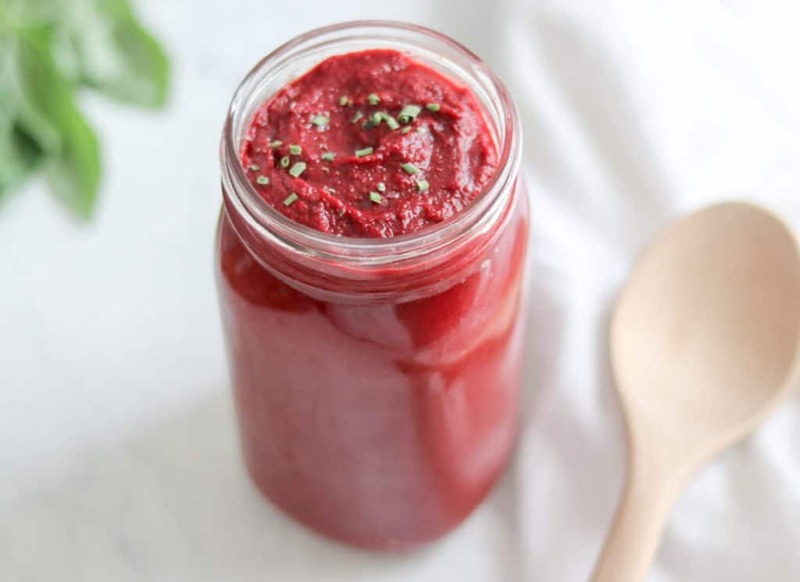 I’m going to have to give this one a try… I’m team No Nightshades myself 🙂 Lately I’ve been using pickled beets for a quick nomato sauce… I’m so bad at prepping it ahead of time. I have to try with this recipe! Thanks! I love the idea of pickled beets! This looks so delicious! Your combination of ingredients sounds like it created the perfect re-creation. Yum! I’m not eating tomatoes right now, so I’m super happy to have found this recipe. Can’t wait to try it! It is so awesome to have a tomato free option for people that can’t have tomatoes. They are such a difficult food to avoid. Oh what a great AIP replacement! I have been avoiding tomatoes recently to see how eliminating them affects my gut, this is a great replacement! This is literally the most genius recipe that I have ever seen! I love a true Paleo recipe – such science is involved. And beets and olives are such a dreamy combo too! I wish I’d had this recipe when we were no nightshades for my daughter, we missed tomato sauce! This is a way prettier color than tomato sauce!! Thank you for a totally different Nightshade Free Nomato Sauce. My first thought was “oh, no, another beet and carrot mixture”….ugh…..THEN I looked over the ingredients and discovered to my absolute delight the never before seen various new igredients to add. Now, I am so excited to make this new version that my mouth is watering just thinking about it…. Haha, I almost didn’t post it since I didn’t think the world needed another nomato sauce. But I just kept coming back to mine since I thought the flavor was so much better! I hope you try it and love it! Loved this recipe! Other nomato sauces have been too sweet. Didn’t see where to add the basil leaves though? I added after the veggies had softened. Thanks for a great recipe! Thank you! I agreed that nomato was typically so sweet, so I’m glad you enjoyed this one as much as I do! I updated the recipe to include the basil leaves – thanks for mentioning that! I am SO GRATEFUL you shared this brilliant recipe!!!! As a marinara LOVER, I’ve tried a few other “nomato”recipes and this is by far THE BEST!!! I get migraines from nightshades, but pizza is my fav food and lasagne is my husband’s. We made a double batch of this and had lasagna AND pizza to celebrate our anniversary!! This recipe looks amazing! I am allergic to all seafood, if I omit the dulse flakes, is there another substitute you can recommend? 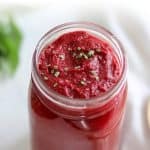 I’ve avoided making other nomato sauces because I have an adversion to beets, but your recipe isn’t so beet dominant and looks very intriguing. Thanks for the inspiration! Hi there, great recipe. I am wondering if I could use sweet potato instead of pumpkin. We don’t get canned pumpkin in our corner of the world and cooking a whole one is somewhat difficult with the size of them (cutting, peeling all hurt my hands too much at the moment)! Sweet potatoes are much easier to handle and affordable here. Hi! I think sweet potato would work, but it won’t have as neutral of a flavor as the pumpkin. What about another mashed squash that’s less sweer? Seems like that could work, too? I haven’t tested it without the spice blend, but I would try 1 tsp sea salt and 1/2 tsp garlic powder. This is a wonderful recipe- first time I have tried nomato sauce and it was a complete success. I did not have dulse flakes (so they were omitted) or the seasoning blend (which I subbed for oregano and thyme), but the flavor was incredible and I was so surprised that I didn’t miss the tomatoes! Thanks for sharing! I didn’t have the dulce or the yeast so I made it without. This is seriously amazing!!!! I was super sad when I realized I couldn’t have nightshades. In this recipe you don’t miss them! I am looking for no-mato sauce for gluten free pasta with no onions or tomatoes. Any ideas. Any ideas? I appreciate your help. Thank you. Would this Nomato sauce freeze well? Hello! Do you have a recommendation on the spices if I don’t have the Paleo spice blend? Maybe just a general estimate on how much of each spice to use. I’m really excited to make this. Thanks a bunch! Hi! This looks amazing! I’m on a modified paleo diet from my doctor and I’m not allowed to have carrots or lemon…Do you know if there is a good substitute? I really miss tomato sauces! You could definitely leave out the lemon or replace with apple cider vinegar. The carrots would be harder to replace without changing the flavor. I would try replacing 1/2 with beets, and 1/2 with canned pumpkin. This sounds good. However I do not like beets (like not at all). Will I taste the beet used in this recipe. I really am missing tomato’s and of the no-mayo recipes yours sounds the most appealing. Yes, you will taste them slightly. I would recommend scrubbing the beets really well, and then just using 1/2 a beet instead of a full one. I hope you love it! This is so great! My six year old loves it and misses tomato sauce so much. He had chili today and said it was better than before! Now I just have to nail down a ketchup and BBQ sauce! Haven’t tried this yet. Was looking for a paleo tomato/nightshade-free spag sauce to go over spaghetti squash. I’ve already thawed ground beef – have you ever used ground beef with this combination? It sounds Good, albeit perhaps a bit sweet? It really isn’t very sweet! Most nomato sauces have 2-3x as many beets and are overly sweet in my opinion. And yes, we almost always have it with ground beef. It’s great! 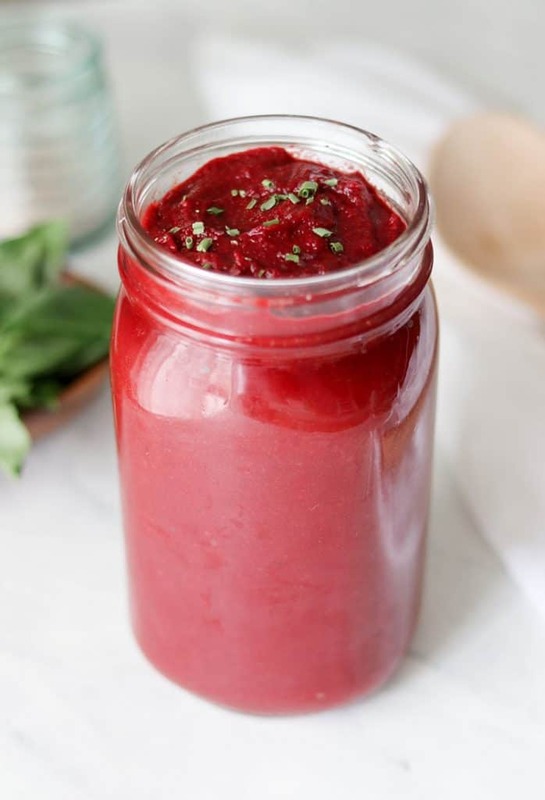 Autoimmune wellness has a nightshade free cherry BBQ sauce I just made which honestly tastes quite a bit like ketchup to me instead of BBQ sauce. Hi, this recipe looks great! The only problem is I’m sensitive to beets. Is there anything I can substitute? Hi! It won’t have the same exact flavor or color, but I would try eliminating the beet and replacing it with 1 additional carrot and 1/4 cup additional of pumpkin puree. In the cooking instructions it says to first saute onions – but how many/how much onion as they are not included in the ingredients list! I’m going to wing it but hope you can update the recipe to include the amount. I no longer miss one of my key pre AIP ingredients! But as I told you, my native Italian, vegetarian, non AIP husband wants nothing to do with it, or such a thing as spiralized carrot spaghetti… his loss! Thank you for this wonderful recipe. Great to hear about the tomato paste sub. I’d love to find an AIP calzone recipe! Do you have one you recommend? Hello. I wonder if you might have a suggestion as to what to substitute for celery. A food test said I should not eat it. I’d just omit it. 🙂 I’ll change the flavor and texture a bit but not much. I don’t see the dulse added at any point in the recipe. It is mentioned in the comments above, but not in the actual prep. Help. I am making this tonight to use in One Pot Unstuffed Cabbage Rolls. I guess I will leave the dulse out for the time being. I understand that it will add the pepper look, but doesn’t it also add the seaweed taste? Thanks. Hi Shel-lee. I omitted the dulse flakes from this recipe since it was an ingredient most people don’t have on hand, and it doesn’t add much flavor to the dish. If you’d like to add them, I suggest doing so at the end, once everything is blended. I’ll edit the recipe now and make note of this.